Sunny Harrington was the daughter of Chip Harrington. Like her father, Sunny has psychic abilities, which offer her immunity from her father's influence. Fearing her father, though, she knew enough to play along with what he was doing. She formed a romantic relationship with Conrad Martin, told him the truth about Charming Acres, and urged him to run away. Conrad Martin races through the streets of Charming Acres, arriving at Harrington's soda shoppe where he begs Sunny to leave with him, but she tells him she can't as she made a promise to stay. 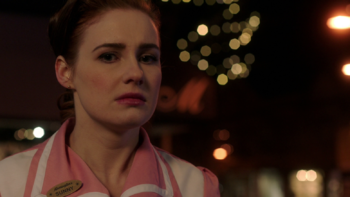 While working as a waitress in her father's soda shoppe, Sunny reveals to Castiel the death of Justin Smith. When Sam is subsequently turned into Justin Smith, Castiel returns to Harrington's to accuse Sunny of being a witch and threatens to forcefully extract what she knows about what is going on in the town. When her father arrives and orders his men to kill Castiel, Sunny runs outside, but is pursued by her father. She accuses him of killing Conrad, but he blames her for telling him the truth and says his death is on her hands. When her father turns his attention to Sam and tries to blow his brains out his skull, Sunny uses her own psychic powers to force her father to stop, locking him away in his own mind where he can be happy without hurting anyone anymore.